This is more of a senryu than a haiku. The tree is found at Maudslay State Park in Newburyport, MA. Politics of life--an interesting idea, Gillena. I saw on FB that this tree is near. It's wonderful, Diane, and your response to it, the way you created the picture is, too. Thanks, Linda. I saw the tree from across the field and couldn't believe it, so I walked closed and the hole goes straight through. Glad you like it Heidil. In full color the emptiness is not there! Love this, Diane. Perfect words and image. Makes me think of staff meetings we used to have when I taught in public school. 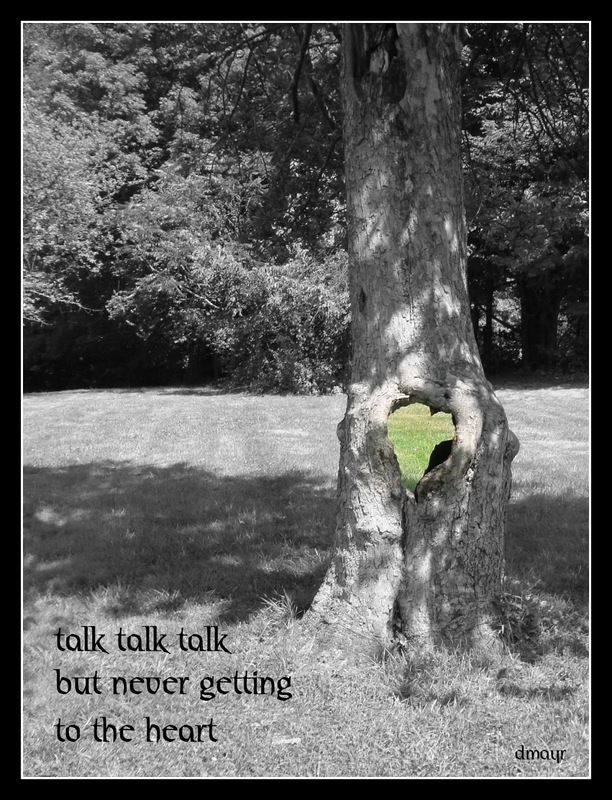 Talk, talk talk never getting to the heart of the problems and nothing ever changed. But, at least this tree has a heart. I'll have to look for it one day. You can't miss it, it's right in the middle of the lawn near the Coachman's House (I think).